The Reader Bee: Countdown to The Hunger Games! Can you believe it??? The release for The Hunger Games movie is a just a few short days away! I, for one, am super excited to see it. So excited, in fact, that I get a little sick to my stomach thinking about it. I am really picky about books-to-movies, and I really hope they did well with this one. Are you excited to see the movie?? Countdown with me! Eek! I know, right?! It's so exciting! 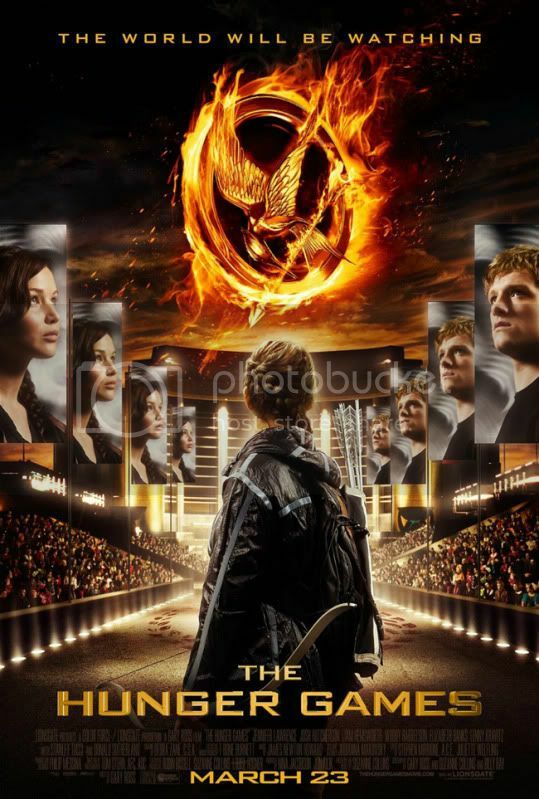 Whenever I see the trailer or a poster, I suddenly chant out: "Hunger Games! Hunger Games! Hunger Games!" It's starting to annoy people.LOL. I really do hope it doesn't let all of us down. Please! Please! Please! I plan on seeing it at the end of the month. But, I'm determined to read the first book beforehand. *gasps* I KNOW. I know, I'm a failure as a person for not having read it sooner, particularly when I've had the entire trilogy sitting on my shelf since December. So terrible of me. But I'm reading it this month! I am so excited! I have tickets for Friday night with my sister and friend. I really hope that they have done the book justice. A reviewer that I trust has said it's good, so that gives me hope. Can't wait to talk to you about it once you've seen it too! I'm so excited!! I really want to see it this weekend. I CAN'T WAIT!!! I'm so excited!!! I'm actually skipping school (bad girl) on Friday so I can go see it during the day. And I might go see it again that night with friends. Yes, I'm obsessed. There is so much hype surrounding the movie and I'm so excited. I really hope I'm not disappointed. I have my ticket for ten a.m.! I am so pumped! It's funny...when I first heard about he movie, I was sort of ticked off because I was sure they'd screw it up but, honestly? I don't think I've been this excited to see a movie in...well, forever! AHHHH I CAN'T WAIT!!! Tomorrow night!! Eep! I think it's going to be fantastic.